A visit to Minnehaha Falls finds the usual collection of tourists admiring the cascade of water tumbling toward the Mississippi River in Minneapolis. There are plenty of photo opportunities, reflective moments and daring ventures to the gorge below. The landscape has been improved too. Buckthorn and other invasive plants have been removed and replaced with native plantings with deeper roots to stabilize the stream banks and prevent erosion. Several natural stream features were added to slow the creek's current, direct water away from its banks and bridge abutments and improve habitat for fish and other aquatic species. All of this work was the result of a multi-agency partnership that formed after heavy rains caused extensive damage to the area in 2005. The damage included sections of fallen limestone retaining walls and steps built during the Works Progress Administration of the 1930's, eroded trails, degraded water quality, and threats to sensitive plant communities. The MCWD worked with the Minneapolis Park and Recreation Board (MPRB), the Minneapolis Veterans Home, the State of Minnesota and the U.S. Army Corps of Engineers to fund a three-phase multi-year project to restore the gorge. "The collaboration of these partners helped to make this restoration possible." said MCWD Administrator Eric Evenson. "It's good to see how many more people are enjoying parts of the park that in the past only the most able-bodied were able to use. But this is a work in progress and we need to be diligent in our efforts to safeguard this important resource." A big part of the problem was storm water runoff from the Minneapolis Veterans Home campus above the falls. When it rained, water used to pour into the gorge through stormwater pipes, washing away the stream banks and endangering the site's historic elements including the ruins of the 1857 Ard Godfrey Mill, Minnesota's first known flour mill. To reduce this flow of rainwater, pervious pavers were installed in the Veterans Home parking lot and driveway, to capture rainwater where it falls and allows it to filter down to underground storage chambers below. This work reduced the volume of rainwater flowing into the gorge by 60 percent. "We appreciate the great care that was taken during the project to preserve the site's unique heritage and historical significance," said Michael P. Schmidt, MPRB Assistant Superintendent of Operation Services. "Minnehaha Falls is a jewel in the Minneapolis parks system and we're grateful to have this historic and cultural resource preserved for generations to come." Minnehaha Falls and the gorge are part of the Minnehaha Historic District, a site listed on the National Register of Historic Places. It was discovered in 1822 by Joseph Renshaw Brown and William Joseph Snelling, two 17-year-olds who came upon the waterfall while canoeing upstream from Fort Snelling. Word spread and in the ensuing years, steamboats stopped at the confluence of Minnehaha Creek and the Mississippi River and visitors made the 4,000 foot trek upstream to admire the falls. The area received even more widespread attention after poet Henry Wadsworth Longfellow published his "Song of Hiawatha" in 1855, which romanticized Minnehaha Falls and drew visitors to Minneapolis. To memorialize the poem, Jacob Fjelde's statue of Hiawatha and Minnehaha was cast in bronze and erected on the shores of Minnehaha Creek above the falls in 1911. In 1885 the Minnesota Legislature established Minnehaha Park as Minnesota's first state park. It was once home to the Longfellow Zoological Gardens (1907-34), the Minnehaha Driving Park horse racetrack (1890's-1903) and a 15-acre campground complete with cabins (1921-1955). The site also gave birth to Minnesota's flour milling industry. Today, more than 850,000 people visit Minnehaha Falls each year and it continues to be one of the most photographed sites in Minnesota. The improvements that have been made to the site ensure that visitors can enjoy the beauty of the falls and the heritage of the gorge in a sustainable way well into the future. Why did the project happen? The project addressed the degradation of the area over time. Structural failures, erosion problems, stormwater management issues, and other problems threaten historic, cultural, and natural resources in the Minnehaha Falls and Glen area and at the Minnesota Veteran's Home. New stormwater management practices were used at the Minnesota Veteran's Home. The project repaired erosion problems with innovative tools like porous concrete and infiltration areas. Added aggregate to the trail to slow erosion and improve "walkability"
Prevented erosion in areas with steep slopes. The MCWD conducted a feasibility-level investigation of problems and issues related to water resources with the area at the outlet of the watershed known as the Minnehaha Glen or Minnehaha Falls area. The proposed project utilizes the expertise and resources of a number of different project partners. Partners include the MPRB, the City of Minneapolis, the State of Minnesota Veterans Home, and the U.S. Army Corps of Engineers. The general goal of the project is to improve the natural resources within the Glen area by developing and implementing a plan to address stormwater management, streambank and bluff stabilization and ecological restoration. Works Progress Administration (WPA) retaining walls at the base of Minnehaha Falls are severely undercut and have collapsed directly downstream of the falls. Rock gabion stabilization on streambank property near the confluence owned by the Minnesota Veterans Home was undercut and collapsed. 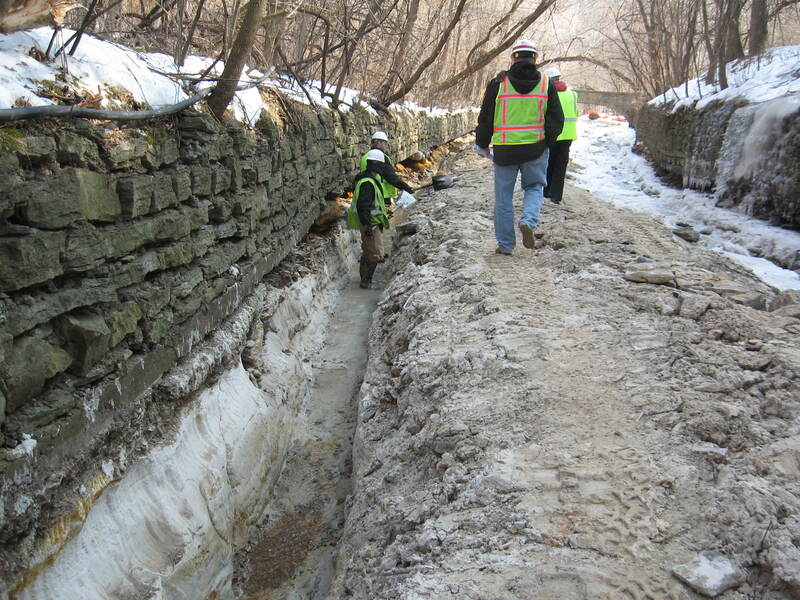 As noted above, the existing WPA walls downstream of Minnehaha Falls have collapsed into the creek and have been severely compromised throughout the park. MCWD and MPRB have issued a joint-resolution to seek Federal assistance from the U.S. Army Corps of Engineers (USACE) to facilitate the design and construction of restoration effort for these walls. Implementation of restoration efforts is time sensitive in order to prevent further erosion of streambanks/bluffs and collapse of additional wall sections. Redevelopment on the Veterans Home Property in 2001-2002 resulted in the creation of two gabion-enclosed stormwater facilities and rock gabion stabilization of the streambank on Veterans Home Property. In preliminary evaluations of performance of each of these features, MCWD has determined each to be failing. Flow paths in the stormwater facilities have eroded and undercut pathways underneath the gabions and flow directly into the creek without detention as originally designed. In addition, the streambank stabilization, as noted above, collapsed into the creek as the result of a 2005 rain event. As with the WPA wall restoration, implementation of stabilization efforts is time sensitive in order to prevent further degradation of the streambanks. MCWD has corresponded with the State of Minnesota (administrators of the Veterans Home) regarding facilitation of restoration efforts. The State has acknowledged an obligation to address the stormwater facilities and streambank stabilization issues. A redesign of these features will occur in conjunction with the maintenance of a bridge on the site in 2007. MCWD will provide technical assistance in this effort to ensure the success of redesigned facilities. MPRB has conducted various ecological management efforts within the park in addition to a proposed redevelopment of the Wabun Picnic Area. These efforts undertaken by MPRB must be integrated into an overall Plan for the park in addition to park use and future development issues identified by MPRB. MCWD has retained a consultant through contract to develop this management plan in concert with direction provided by MPRB, the State of Minnesota Veterans Home and the general public. The consultant is currently working closely with all organizations to develop a list of improvements mutually acceptable to each agency. On July 24, 2007, MCWD and MPRB held a public meeting at the Hiawatha School Park to discuss the range of improvements that may be included in a potential project on the site. A PDF of the presentation can be downloaded at the bottom of this page.